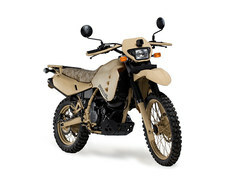 The HDT M1030-M2 670cc JP8 is the latest incarnation of the superlative military motorcycle standing alone as the only military motorcycle capable of operating on JP8, JP5, JP4, AVTUR, JET-A1, Diesel and even Biodiesel. Evolved from HDT’s M1030-M1 originally developed and produced for the U.S. Marines in 2004, the M1030-M2 670cc JP8 utilizes HDT’s fourth generation heavy fuel motorcycle engine with patent pending MAC-Ci Advanced Multifuel Technology producing 20% more power over previous generations. The M2’s refined chassis with newly engineered swingarm improves handling while its 5 speed transmission and updated suspension enhance ridability. All new high performance illumination including standard IR and blackout lighting improve tactical performance. An updated exhaust system meets more stringent noise and emission regulations while still maintaining peak performance.